There are a few parts of parenting that should be easy…and yet they are not. Like potty training, getting kids to sleep and feeding. All basic human functions that little humans don’t seem very good at! The first two get significantly better after the age of five. But that last one can be a challenge from day one on. My love language is feeding people. Seriously. I am so happy if I can cook nourishing food for friends and family. It is one of my favorite things to do. Before I had kids I couldn’t wait to feed them! When my first child was little I was giddy when she was finally old enough for solids. But like most aspects of parenting things don’t always go as you plan. In my nine years of parenting I have been faced with challenge after challenge when it comes to feeding my kids. Everything from oral sensory processing disorder to extreme allergies to complete refusal to eat anything. Talk about crushing this mama’s spirit! Have you been there? Do any of these sound familiar? Is your child an under-eater/doesn’t eat enough? Does your child never seem hungry or can’t listen to his own hunger cues? 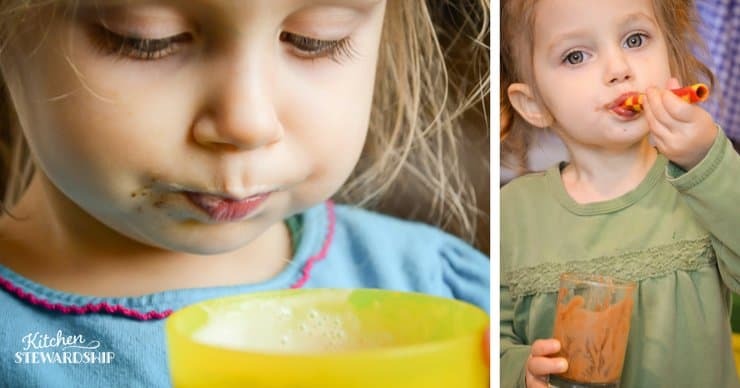 Does your child struggle with chewing and swallowing food? Does your child eat really slowly? Does your child have a very limited diet due to refusal to eat certain foods or whole food groups? Does your child only want starchy foods? Is your child hungry all the time but never seems to get full and doesn’t gain weight? If any of these resonate with you, welcome! You are in good company. I’ve dealt with all of them! My first child could hardly chew. My second child eats non-stop but never seems to get full. My third child just stopped eating all together! Unique challenges that all left me frustrated and unsure of how to keep going. But I did not give up. God does not give us more than we can handle. And He has a purpose for our struggles. I have successfully come out on the other side of our eating trials. I now have three well-nourished, good eaters. I let my kids drink their way to full health! 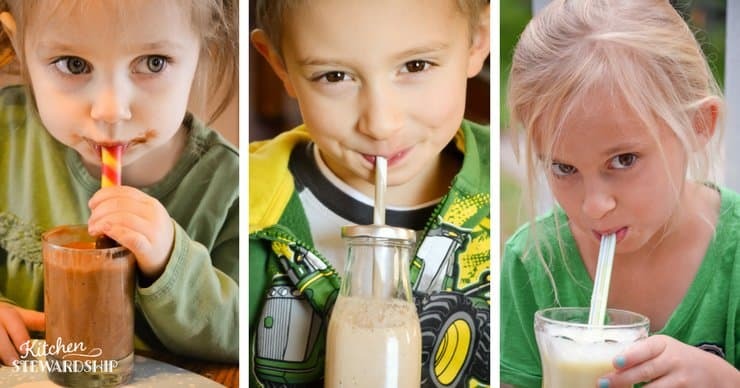 After I had exhausted every other method of getting my kids to eat I figured out that the root causes of eating challenges are often nutritional deficiencies, poor gut health and allergies. So I addressed all of them at the same time with nutrient-dense drinks that taste amazing. And one cup at a time my kids got back to full health. Even my toddler that literally got the point of eating nothing. She had so many allergies I was actually afraid that she would run out of safe food to eat. Now she can eat almost anything! And eat she does. I am truly humbled and amazed every single day when I watch her eat. My little half pint (our nickname for her because she’s so tiny due to her eating challenges) will now grab the serving bowl of Brussels sprouts at the dinner table and declare they are hers and that nobody else can eat any. And she actually eats almost all of them! She asks for sauerkraut and roasted beets for a bedtime snack. Sardines and eggs top her list of lunch options. She’ll eat gelled homemade broth or desiccated liver right off a spoon. Are you ready to turn your picky eater into a well-nourished, veggie lover? Check out my book Easy Nourishment For Picky Eaters. 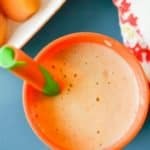 I have over twenty delicious drink recipes that are loaded with essential vitamins and minerals. Pick a new flavor every day to get on your way to full health. 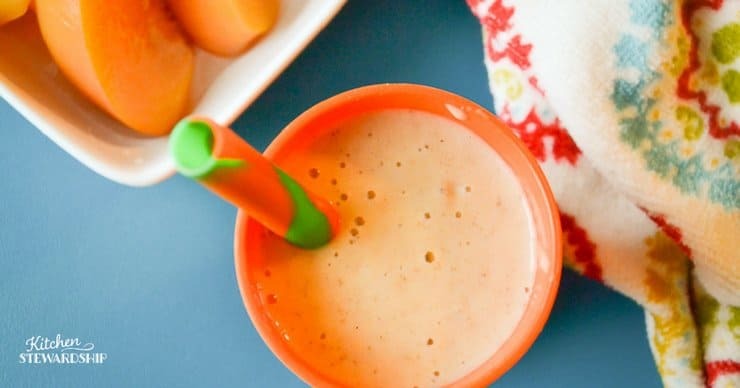 Today I’m sharing my son’s favorite drink – peach cobbler. He requests this all the time – even when he’s sick! It tastes like fresh peach cobbler on a sunny, summer day. 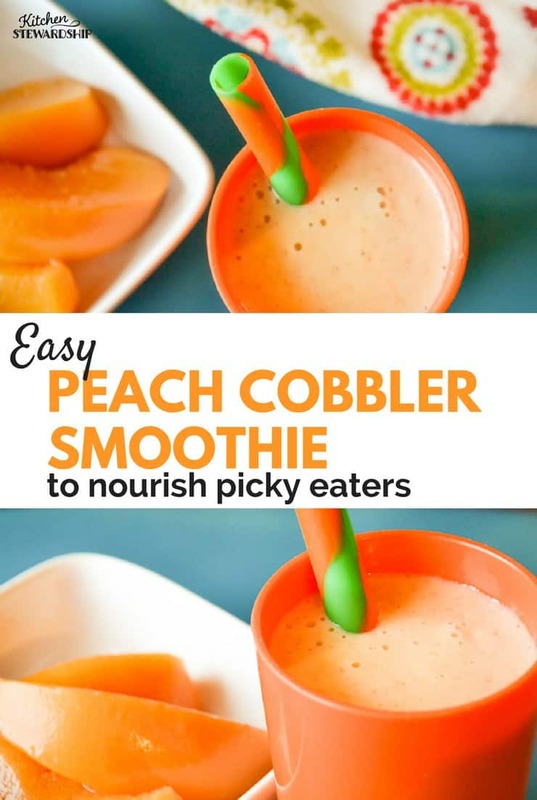 A nourishing drink that tastes like peach cobbler. Combine all of the ingredients in a blender and blend on high until smooth. Eating challenges can make day-to-day parenting stressful. Turn those struggles around and bring the joy back to meal times with nourishing drinks. A well-nourished child is a happy child. For more information on picky eating and other feeding issues check out my book Why Won’t My Child Eat?!. I get down to the root cause and give tips for getting back on track. 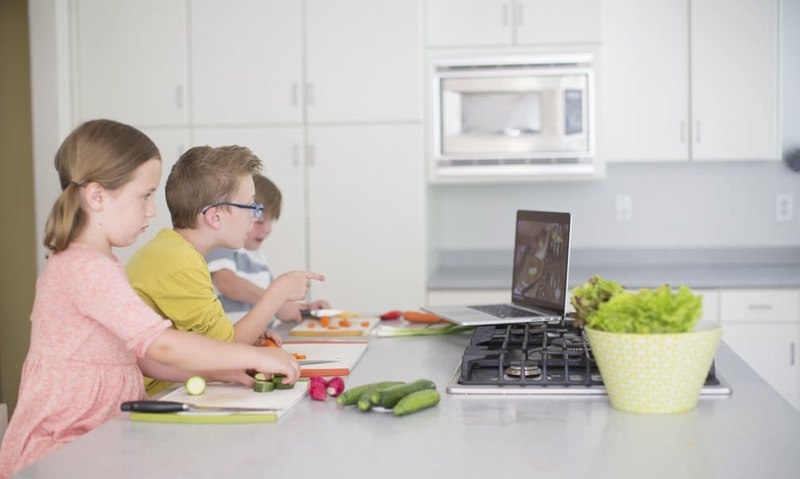 My kids and I created the Kids Cook Real Food eCourse, an online cooking class especially for kids to help bring real food and independence to families all over. Over 10,000 kids have joined us and we’d love to invite you along for the adventure! How have you helped your child stayed nourished while working through eating challenges? A lot of mothers have also found that unrecognized/unrevised tongue ties are at the root of their children’s eating issues (yes, even for those who aren’t babies anymore). Just wanted to throw that out there in case anyone reading this post needed that tidbit. I have struggled with a lot of food sensitivity issues myself, and I can attest to the fact that drinking my calories (in a healthy way, like this!) can be a huge help. Besides sometimes being more appealing, it can really just be a lot easier to get it DOWN when you have no appetite because your body’s been trained that “food is harmful” than eating solid food. Great tip, Rachel!! My youngest had her tongue and lip tie revised twice! Hi Mary, did the tie revision help in anyway? My now 5 year old had trouble nursing as an infant, and a lactation consultant said he was tied. but we did not get it revised at the time, and he has turned into a super picky eater. He may also have gut issues from c-sec birth and the diet we have been on so far. Im interested to know if the tie reversal has helped anyone with picky eating. Yes, the revision definitely helped Ann. It was hard to tell the total impact since we did it when she was 6 months and 10 months and we were also dealing with severe allergic reactions at the time that made her tongue swell…and didn’t even know it!! Crazy and scary. In the end I was so glad we did. Before the revision she couldn’t even stick her tongue out at all and she had nursing struggles from day one. My oldest had her lip revised at age 7. That was a big help as well. My son is almost 6 and we keep debating about revising him too. It’s not impacting his eating in any way, but possibly his speech. I know it sounds super scary, but it’s really not that big of a deal. My daughter was so worried about hers and it was over in about 20 seconds and she was totally fine. And we’ve been so glad ever since. It definitely can have an impact on eating/picky eating. How old is your son, Savannah? Eating a ton can be a sign of blood sugar issues. My son is the same way. He eats so much but is quite thin. I’m trying to help balance blood sugar for him. Eating a lot can be totally normal too. Just wanted to throw that out there. Quite audacious claims that drinking smoothies will fix. I understand being well nourished helps appetite and perhaps oral sensory issues, etc. But to think a smoothie, even healthyhealthy, even daily, is the fix? It will not fix everything, Helene. But it will help to add nutrients to your diet. I have a wide variety of nourishing drinks in my book, many of which do contain greens. But not all of them do. I like variety. These are not meant as meal replacements. They are additions to your diet to boost nutrition. You should still eat a balanced diet filled with nutritious real food. You can get kids to eat dulse flakes off a spoon too. Nori sheets are fun to crunch on plain, but the wasabi are wow, yeah. Seaweeds are all high mineral powerhouses. It’s fun to play around with nutrient boosting supplements, Helene. We use quite a few (many not listed in this particular drink) and rotate through them. I suffer from IBS and try to stay away from grains and high fiber meals. This leaves me with little choice for breakfast. It also doesn’t really help that I’m a picky eater. That’s why I love my smoothies. It is such an easy meal for me to drink in the mornings. This looks like a nice “gut-friendly” recipe that I’ll be adding to my diet.